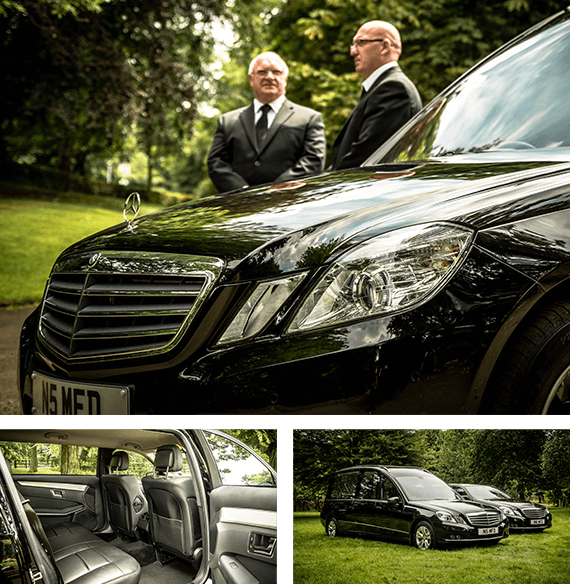 We operate coach-built Mercedes Benz funeral vehicles which are maintained to a very high standard. From time to time, other purpose-built funeral vehicles may be employed in the course of servicing our clients' needs and we do our best, in co-operation with other carriage masters, to accommodate any special requests. Horse-drawn hearses can be employed, in conjunction with motor limousines, to achieve a more traditional and nostalgic funeral cortege. This is becoming an increasingly popular option which we can discuss and provide where appropriate in accordance with your wishes. Other less common cortege vehicles are available for example a motorcycle and sidecar hearse. We are happy to listen to specific requests and will do our best to accommodate. We are able to provide specialist vehicles for the dignified transportation of wheelchair users in funeral corteges.